All it takes is an invitation: For Mary Annette Dworshak’s mother Bea, it was Monsignor Hennessey’s invitation for her to be one of the first lay teachers at Sacred Heart Grade School in Miles City, Montana. For Mary Annette, it was the invitation of Sister Cecilia Horan, OP, to think about attending Holy Names College in Spokane. Once there, Mary Annette discovered a culture of call that challenged her to believe that a few dedicated persons could say ‘yes’ to religious life in the turmoil of the mid-60s, and that she would be blessed with courage when her Community assigned her to be the only woman in the graduate philosophy program at Gonzaga University. After completing her master’s, Sister Mary Annette taught English and Religion at Holy Names Academy in Spokane for five years before moving to Holy Names Academy in Seattle, where she has taught for 43 years. For many of these years, Mary Annette coordinated HNA’s Peace and Justice Program inviting the school community “to act justly, love tenderly, and walk humbly with our God” (Micah 6:8). In Mary Annette’s passion for the SNJM corporate stands on human trafficking, water and migrants/refugees, she serves on the Congregation Justice and Peace Network and chairs the U.S.-Ontario Justice Network. As an educator, she encourages others to become aware of these justice issues and to collaborate to effect change. 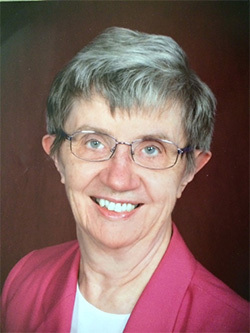 In addition to saying “yes” to teaching classes and webinars on the History of the Church USA for the Catechetical Certification Program of the Archdiocese of Seattle, Mary Annette has helped the Sisters of the Lovers of the Holy Cross in Hue, Vietnam, improve their English conversation and has studied at Yad Vashem, the International Holocaust Center in Jerusalem.